A 26-year-old engineer-turned-author in Puducherry has translated 700 Sanskrit shlokas from Bhagavad Gita into English. 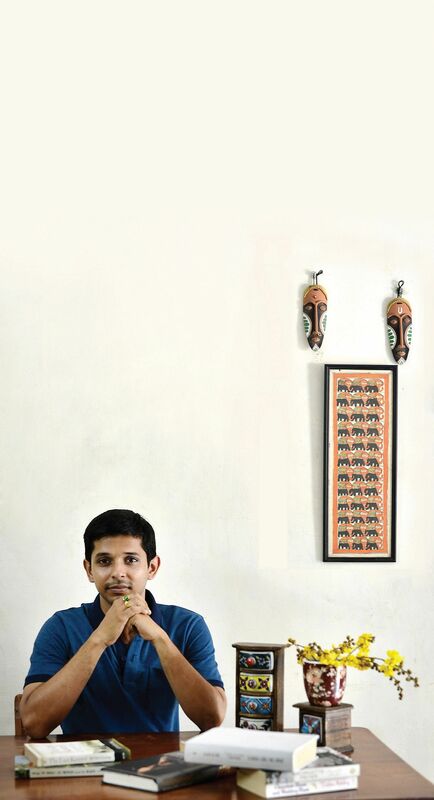 Puducherry-based author Sushrut Badhe will have the ears of his audience on April 26 when he will be engaged in an interactive session organised by Sri Aurobindo’s Action and People for Pondicherry Heritage at the Palais de Mahe Hotel. The topic will be his book, Bhagavad Gita: The Rhythm of Krishna, a rhythmic versification of the sacred text. Badhe translated 700 Sanskrit shlokas of the 18 chapters of the Bhagavad Gita into English verse, which earned the 26-year-old a place in the India Book of Records. Words from the Bhagavad Gita spill effortlessly from Badhe’s lips in odd contrast to his age. For Badhe, a mechanical engineer who had planned to go abroad for higher studies, writing about the Gita might have been farthest from his mind if he had not met Madhusudan R Damle, former founder-trustee of the Auro Service Trust. “Meeting Damle changed the course of my life,” says Badhe, who is also interested in his mentor’s business of manufacturing ayurvedic medicine. Badhe chanced to come across Gita Ovachar, a book about the Bhagavad Gita for children in which Gita is depicted as a feminine character born from the mouth of Krishna. The simple rendition of the Gita in a story form prompted Badhe to write about the scared book. “My teacher encouraged me to write in verse form. Children learn through nursery rhymes,” says Badhe, who took about a year-and-a-half to complete his book, which was published in 2015 by Sri Aurobindo’s Action. His first book was Rhythm of the Spirit, a collection of poems. One of them, A Father’s Song, was appreciated by the late President APJ Abdul Kalam. Prior to the release of the book on the Gita, Badhe had released the first six chapters as an e-book, Voice of Krishna: Secrets of the Self, on the Amazon Kindle. It won him a place in the India Book of Records in December 2014 as it was the first rhyme book on the Gita. There have been many commentaries on the Gita, and Badhe’s approach has been decidedly different. “Most commentaries club the verses, giving the collected meaning. I have explained each line of the verses, with the numbers against the English version corresponding with the original Sanskrit,” he says. Badhe relied on Essays on the Gita by Aurobindo, Commentary on the Gita according to the Vaishnava tradition, and the books from the Gita Press of Gorakhpur. “The book’s aim is to reach the English-speaking population while helping in empowering the reader in his personal life,” he adds. The book is multi-layered, offering practical and metaphysical knowledge, with the reader free to take away what he understands best. “Krishna does not give any direct instruction to Arjun. The only instruction he does give is to not impose the Gita on anyone who does not want to hear it,” explains Badhe. The author has been also using Vedic chants to cure children of autism, for which he collaborated with the Department of Genetics, Madras University. The scholar’s next book will be on the Upanishads, again in rhyme form.